Experimente a beleza que rodeia Amsterdam nesta excursão super saver que combina dois tours de topo por um preço baixo. Passe o primeiro dia explorando os canais, igrejas e lojas de Bruges, seguido de um segundo dia se aventurando no interior da Holanda. Descubra os moinhos de vento e o charme de Volendam e Marken enquanto explora Zaanse Schans. 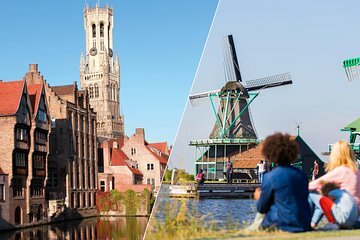 Seu Amsterdam Super Saver: a viagem de um dia em Bruges e a viagem de meio dia entre Zaanse Schans Windmills, Marken e Volendam combinam duas excursões principais por um preço baixo. Passe o primeiro dia explorando a idílica cidade de Bruges. Você viajará de Amsterdã para este destino belga a bordo de um ônibus confortável. Após a chegada, você terá quatro horas para explorar a sua vontade. Passeie pelas ruas de paralelepípedos, flutue ao longo do canal, passeie pelas ruas de pedestres e entre nas lojas pitorescas pelas quais esta cidade é conhecida. Seu guia amigável oferecerá dicas profissionais e muitas informações e percepções antes de sair às ruas sozinho para um dia de exploração. Não deixe de conferir destinos como a Basílica do Sangue Sagrado (Heilig-Bloedbasikiek), onde está exposto um vil sangue de Jesus, e o Groeningemuseum, onde a arte medieval é orgulhosamente exibida. Você terá tempo para relaxar e provar alguns dos famosos chocolates da Bélgica na sua viagem de ônibus de retorno a Amsterdã. No segundo dia, você passará meio dia navegando pela paisagem campestre da Holanda no conforto de um ônibus. Seu guia de áudio compartilhará informações sobre os pontos turísticos e pontos turísticos ao longo do caminho. Faça uma parada na aldeia de Volendam, que é conhecida por seus barcos de pesca e fábricas de queijos. Você terá a oportunidade de visitar uma fábrica para ver como o queijo é feito, antes de passear de barco até Marken, onde você pode passear pela vila de pescadores a pé. Há ainda tempo para ver os tamancos locais de sapateiro à mão! Em seguida, você viajará para Zaanse Schans, onde moinhos icônicos pontilham as paisagens. Visite um estaleiro histórico repleto de edifícios que lembram os séculos XVII e XVIII, antes de retornar a Amsterdã à tarde. The tour to Bruges was amazing. I wish we would have had more time. Schans Windmill, Marken and Volendam was more than we had expected. I would recommend this tour to everyone. Terrific day trip. Good guide.. Bruges and Windmills, Marken and Volendam are must sees if visiting Amsterdam. It would be 5 stars but for the incessant rain in Bruges. Also the guide spoke in 2 languages and although very knowledgeable it does make a difference. The group was too large to handle. The city itself is good for shopping anything especially chocolate. Tasty waffles and frites. Chocolate prices are as expected but fashion seems to be lower in price than in Amsterdam. The trip to the windmills was handled by 2 excellent guides and also the driver was excellent thus nullifying the big group problem. The visit to the cheese factory in Volendam was a great experience. Not sure the prices are lower here. The Marken trip was nice with some great photo opportunities. The prices here are certainly higher than in Amsrterdam. I can only hope that any other reader when he goes to Bruges will have a less rainy day. Viviana and Von? were great tour guides. Both Tours were excellent and really enjoyed the effective communication and the information that was given by the tour guides. Windmills were fabulous. Very informative. Market was where to clog factory was.. Very cute town, saw the shoes being made. Vole day was a nice 1/2 hour boat ride away. Went to,cheese factory there. Beautiful lakeside town with shops,and restaurants. Had lunch there. Excellent. This was a good whirlwind introduction tour to the Dutch countryside, but I felt like we were taken to three gift shops and had little explanation about the communities we were seeing. The highlight was seeing the inner workings of a windmill, but we had barely 45 minutes and could not explore anything else in Zanse Schans. Then it was back in the bus and off to the next gift shop in Volendam. Then a ferry ride and a walk throug Marken to a clog maker's shop. Little to no explanation of what we were seeing, history of the villages, etc. the whole experience felt rushed and commercial. Fortunately, the tour included time for lunch that many other tours don't accommodate. Edgar, the tour guide, was very pleasant, gave some humorous anecdotes and made the young children on the tour feel welcomed. Bruges was amazing, however it was super crowded and it was a 6 hour round trip bus ride to get there. I would recommend renting a car or taking a train there and spending the night so you can see Bruges at night without all the tourists. We skipped the windmill tour as we were sick of being on a bus. The tour is full day and goes by quickly. The trip to Bruges on a very comfortable coach was long and maybe took a little longer than expected but they made it up to us by staying a bit longer. Bruges was lovely and our guide was an elderly gentleman who gave a great historical tour of this small town. The tour of Zaanse Schans, Marken and Volendam was fantastic Great places to visit and learned a lot about the Netherlands in general. We got to taste some very fresh seafood sandwiches and bought our clogs at one of the shops. Very cool and highly recommend. This excursion was truly amazing!!! Both days we had knowledgeable and amicable guides. So helpful and informative...also there are a few wonderful surprises for travelers. I highly recommend this trip! A pesar de que la visita fue breve,es una ciudad que merece la pena ver.